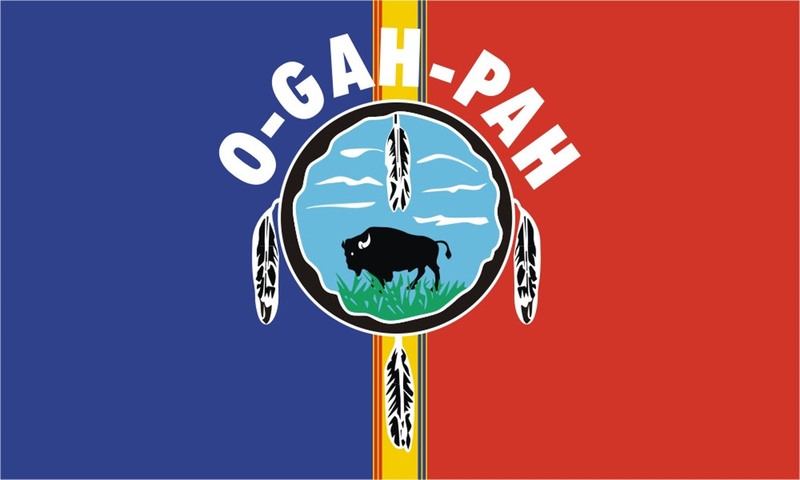 In the late 1970’s, as other Indian nations in northeast Oklahoma were developing and displaying tribal flags, it was decided that the Quapaw Tribe needed a flag as well. The Tribe’s Business Manager at the time, Lloyd Buffalo, and the Tribe’s Secretary-Bookkeeper, Barbara Kyser Collier, developed various ideas, and together with Assistant Business Manager Walter King designed the tribal flag. The original design was drawn by Barbara on cardboard. The first flags were produced on stiff canvas, on which a local artist painted the design. The four eagle feathers represent the cardinal points of the land. The number four is sacred to the Tribe and is found in many of our ceremonies and practices. The Quapaw People hold the eagle in high esteem because it flies the highest in the sky, which puts him closest to the Creator. The Tribe believes the eagle talks with God, and eagle feathers are used in many of our ceremonies. The red and blue background of the flag represents a kind of blanket used in Native American Church meetings. This blanket is made from wool broadcloth, this cloth is used by our people for traditional clothing such as leggings, breechcloths, and skirts for women and was originally obtained through trade with Europeans. The Quapaws were one of the early tribes to follow Native American Church as a form of worship. The Quapaw helped spread this form of worship to other tribes, some of these tribes still say special prayers for the Quapaw people in their meetings.